The global energy storage market is expected to “explode” (perhaps not the best term to be using) to an annual installation size of over 40 gigawatts by 2022, from just 0.3 gigawatts in 2012 and 2013, according to market research firm IHS, Cleantechnica has reported. The annual new installation capacity is expected to reach about 6 gigawatts by 2017, and then grow to reach 40 gigawatts 5 years later. The report predicts that the United States will be the biggest market in the world for grid-connected storage installations through 2017. This is despite China having installed nearly as much solar power in 2013 as the United States has in total. It is predicted that the United States will install 43% of the new storage capacity out to 2017. Top renewable energy markets Germany and Japan are expected to be two other energy storage market leaders. The top technology for all this energy storage growth is expected to be lithium-ion batteries. 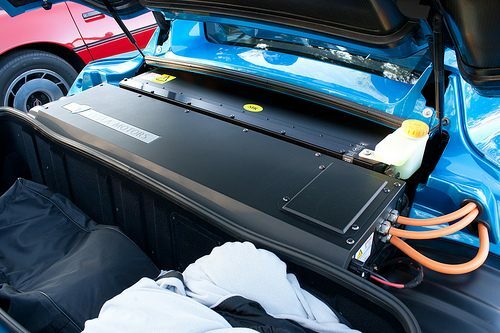 Over the longer term that could change, but for the medium term the market for lithium-ion batteries is expected to go through a period of huge growth. When there is technology innovation, don’t expect to come from Silicon Valley, Gigaom has suggested today. There are various reasons put forward for this, including the lack of battery expertise in the Valley, and that battery progress tends to come from the Asian battery giants such as Panasonic. As a case in point, although Tesla Motors started-up in Silicon Valley and the factory is based in Los Angeles, the company recently signed a deal with Panasonic for 2 billion lithium-ion battery cells over 4 years.